With my newly discovered burst of self-confidence, I decided to launch my business career. But where to start? I’d once entertained thoughts of owning a restaurant. I knew nothing about restaurant operations, so I thought it would be less risky to start out with hot dog stands. I bought five of them, and in the winter in Phoenix, Arizona, they did really well—in the summer, however, not so much. In 1993, I launched what became NextCare Urgent Care, which at one point was one of the largest privately held urgent care companies in the country. Two physician partners and I started NextCare with $10,000. One partner bailed out after two weeks and the other is still a stockholds, but didn’t want to take on more debt or risk. I didn’t take a salary for 11 years and worked about 80 hours a week on top of practicing emergency medicine. A men’s sportswear line called A-Game—and a women’s sportswear line called Such! Until sometime after NextCare was in existence, one common denominator fit a lot of my earlier business ventures, at least initially: I didn’t know what the hell I was doing! Prior to earning an MBA, the only business class I’d ever taken was typing (which I failed) in high school. Hence, I operated on a purely gut level instinct and made lots and lots of mistakes. For example: my snow shoveling and grass cutting abilities nearly got my parents sued; my candles melted without lighting; and my chocolate tasted oddly of wax. (I used the same molds.) Who knew? I once ran out of gas in my ambulance just after I’d dropped a patient with an abdominal aortic aneurysm off at the hospital. Once I got very hungry while flying a helicopter and landed out in the middle of the reservation, right next to a small Indian Fry Bread stand. How could I have known the five-gallon container of powdered sugar wasn’t covered? Those poor people wound up looking like ghosts as a large plume of powdered sugar rose from the roofless stand. Not surprisingly, that was our last meeting. Consequently, she never told me that men should not wear shorts on television because, when you’re sitting down, low angle camera shots tend to enter the domain of the Spice Channel. Needless to say, the show’s ratings went way down and one kind viewer wanted to start a nonprofit fund for me—use your imagination. But I learned—and learning is the key. The point is this: if you approach failure as simply a hurdle to jump or an event from which you can learn, failing’s not so bad. 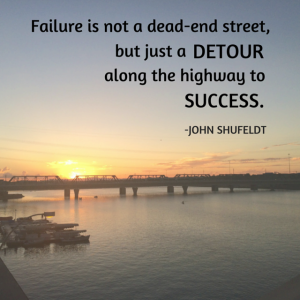 In fact, it may lead to your next success. If you’re willing to learn, willing to risk, and willing to either conduct serious reflection or accept criticism from others, failure is a necessary ingredient of success. 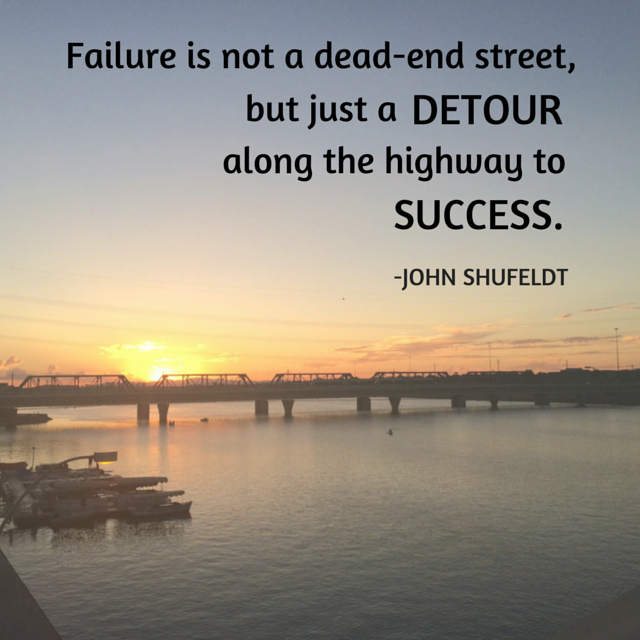 Failure has many wonderful and valuable lessons to teach us, so let’s look at a few examples of successful people who learned that failure is not a dead-end street, but just a detour along the highway to success.